Piano Teacher End of Year Recital Card. 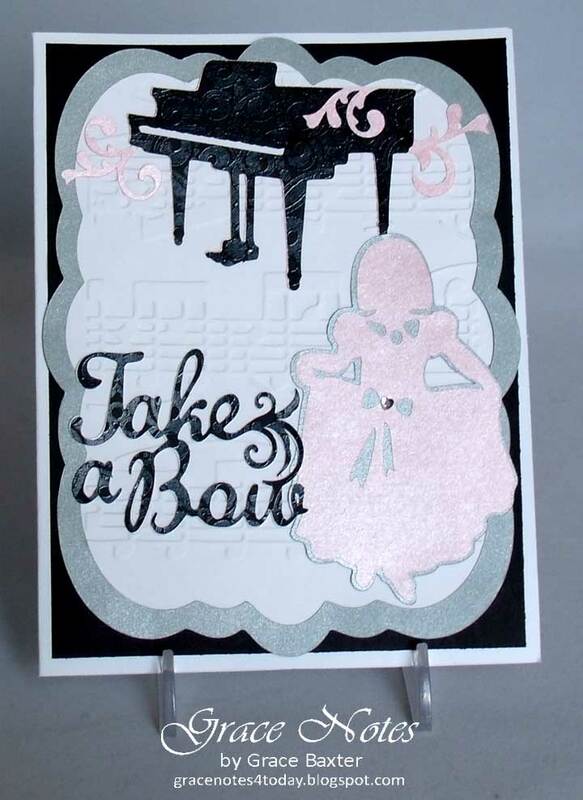 A special card for a very unique occasion... the end of year piano recital. Designed by Grace Baxter of Grace Notes for Today. A unique occasion requires a card that tells a unique story. My sister Ruth, having followed in the footsteps of our Mom, is a piano teacher. Each June she holds a recital for her students, and this year will be her biggest one yet. 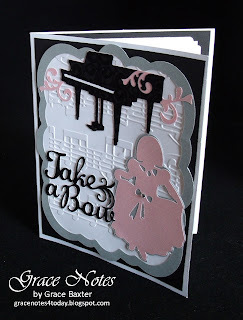 A piano recital is definitely one of those special occasions that needs to be recognized with a personalized card. I well remember Mom's recitals when she would have her daughters play and or sing as part of the program. I recall Ruth as a little girl, dressed in a fluffy pink dress and patent leather shoes... perched on the piano bench, her feet not yet touching the floor. This vision in my mind was the inspiration for the card's design. I love the image of the little girl curtsying after playing her piano piece. 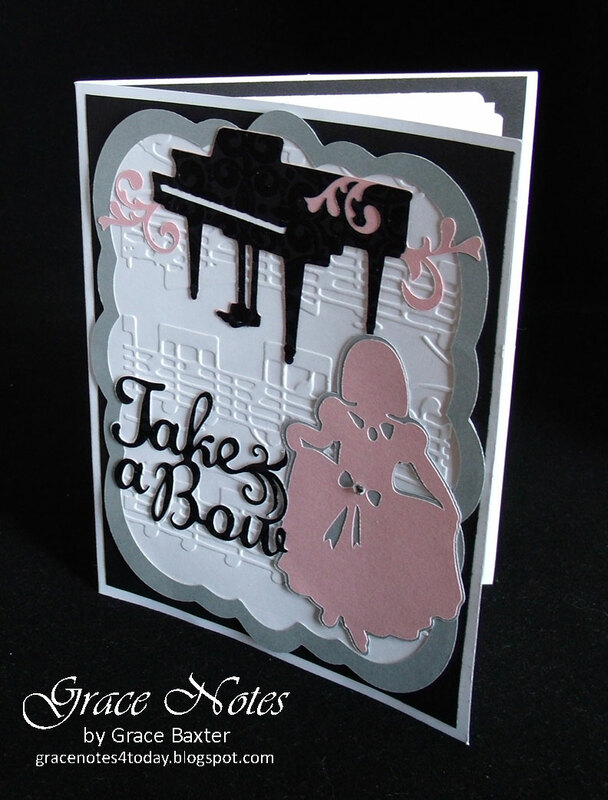 Piano and "Take a Bow" phrase are cut from black cardstock that has a swirly shiny design. The picture at left illustrates this. Pink and gray paper is pearlized. The verse was prepared on the computer, printed and trimmed to fit. I incorporated the word "Bravo" into the verse, placing it near the bottom. Pianists are typically presented with roses at the end of their performance. I like that this phrase includes a rose. 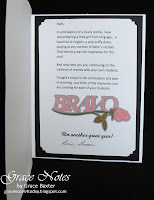 The "Bravo" phrase was cut from a pink pearlized paper, shadowed in gray, then I painted the rose stem green and outlined the bud in pink Promarker. 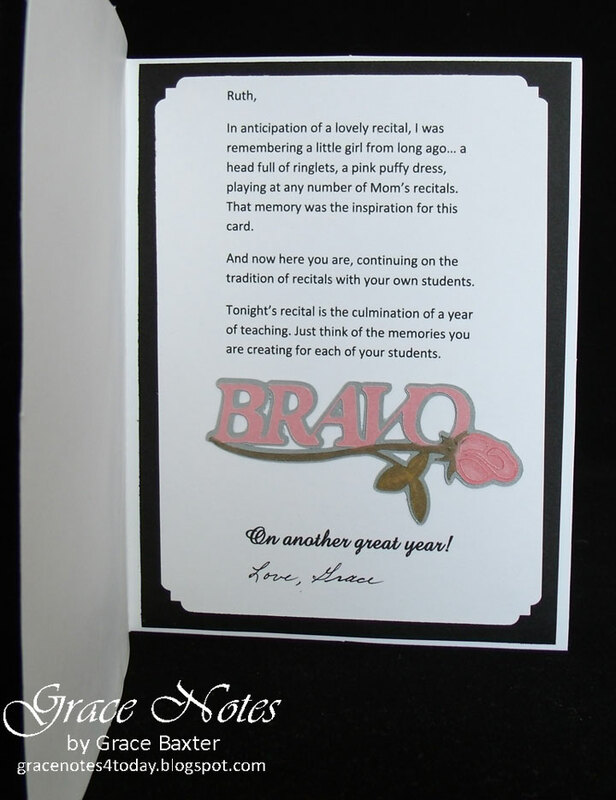 A beautiful card Grace. Love the ensemble and the fabulous note to Ruth, so wonderful that you have been able to personalise this. TFS and have a great weekend.